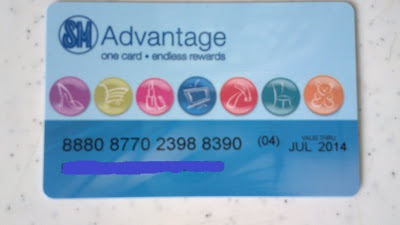 Home / Lifestyle / SM Advantage Card / SM Advantage Card or Disadvantage Card? SM Advantage Card or Disadvantage Card? It’s already my third SM Advantage Card. I started using it since 2008 from Baguio city, to Metro Manila, and now in Pangasinan. From the very first time I’ve used it and it expired, I already know that the most I’ve earned is enough to pay for the renewal card. This made me think if it’s really an advantage card or can it be more like a disadvantage card? I thought my hubby and I were the only ones calling this card as the SM Disadvantage Card but I was wrong. I Googled it and lo! Numerous other users have been labeling the card in the same manner too! But I still keep on renewing anyway. Simply because I frequent malls, particularly SM malls. Although I’m not a big spender, I spend money on such malls nonetheless. Even if it’s not noticeable, there are numerous advantages associated with this SM card. With it, you can get discounts at participating stores through a coupon bundle, earn points which can be used to redeem items, use the same points for purchases if you have accumulated a lot of points, and become eligible for the SM Prestige Card. Free delivery with minimum purchase at SM Appliance Center, Ace Hardware, Our Home, and Makro. Makro is now owned by SM Group of Companies by the way. SM Prestige Card is only for those who have spent Php 300,000 during their 2-year membership period for SM Advantage Card. The SM Prestige Card is then awarded for free and will be valid for 2 years. Going back to the Advantage card, application is easy. Just make a purchase at any SM mall stores including the department store and hypermarket. Buy the membership kit for Php 150. Use the temporary card assigned and claim your permanent card after 21 days. You can also start taking advantage of the coupons included in the kit. The permanent card issued, bearing your name is valid for two years. From then on, renewal will be every 2 years with a Php 100 pesos renewal fee. The renewal card will be released without having to wait for days. It will be available after only a few minutes. Although this card appears as if it is actually a disadvantage to use, I’ll still continue renewing and using the SM Advantage Card.